Rebels' Dream Of 'Free Libya' Dims NPR's Lourdes Garcia-Navarro saw the rebels' mood change dramatically during the three weeks she spent reporting on the revolt against Libyan leader Moammar Gadhafi. As Gadhafi's forces gain ground every day, the rebels' bravado has faded to fears of abandonment. 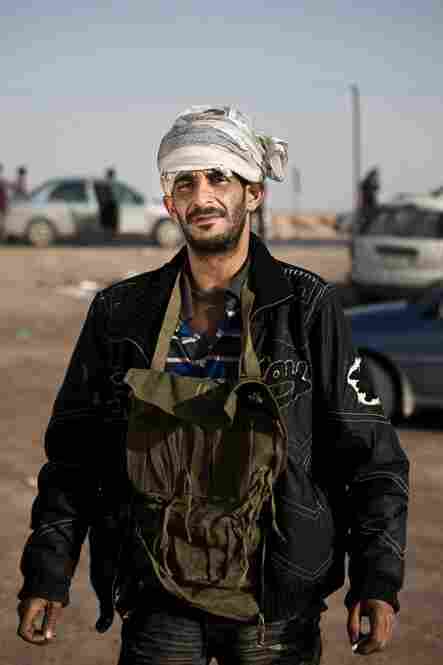 These anonymous portraits show some of Libya's rebel warriors in the crossroads town of Ajdabiya during the first week of March. The men in these photographs are soldiers, laborers, businessmen, students and unemployed youth. The rebels had no training, no leadership and no real help. 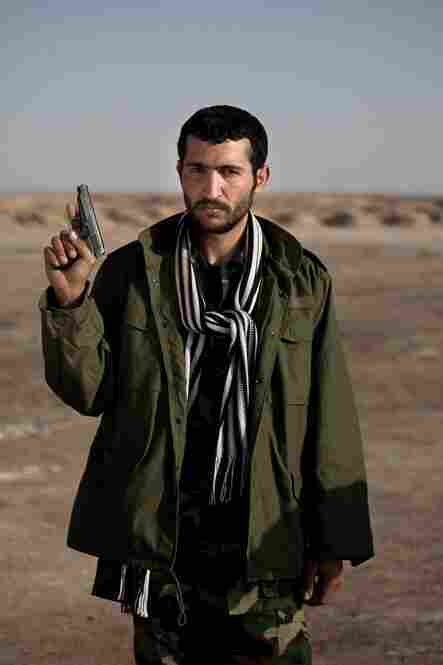 Hundreds of revolutionaries congregated in Ajdabiya to fight Gadhafi's army. They were certain they would be able to topple Gadhafi's regime and were willing to fight — and die --for the cause. The weapons the rebels used proved to be no match for Gadhafi's forces. 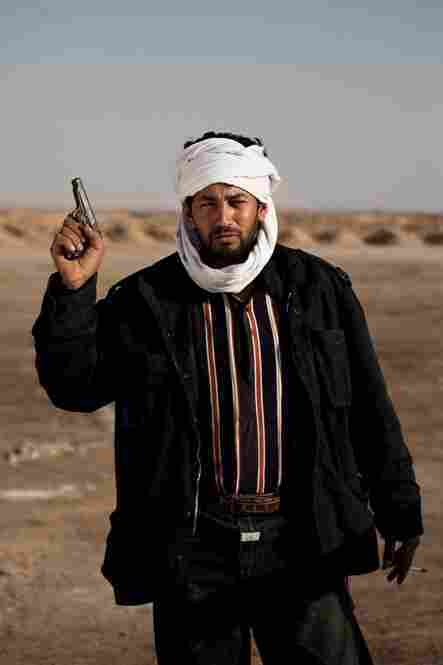 When this man arrived in Ajdabiya he was full of confidence. Laughing people pressed close to touch him. The next evening he was in a field hospital, his face covered in ash, unable to speak, shell shocked from an airstrike on the road to Tripoli. 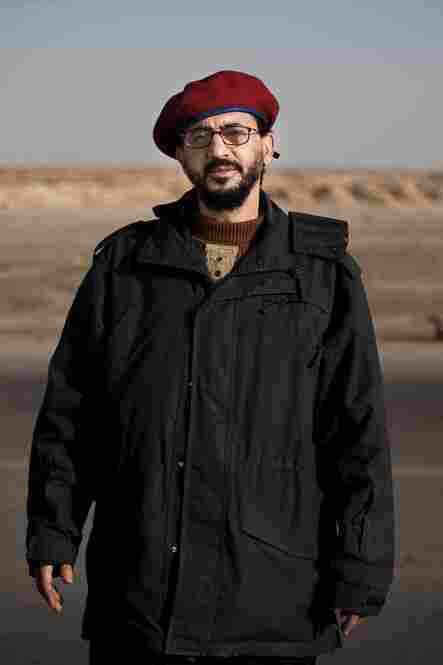 The Libyan soldiers who initially defected to join the rebels have largely left; the rebels were eventually overpowered by Gadhafi's army. NPR correspondent Lourdes Garcia-Navarro recently left Libya after reporting on the revolt against leader Moammar Gadhafi. We arrived in eastern Libya, scant days after the uprising began last month, to a triumphant welcome. "Free Libya!" people exclaimed proudly. Every time they greeted us, they explained that they had done it themselves — thrown off the yoke of a despicable regime — and needed no further help to get rid of leader Moammar Gadhafi once and for all. 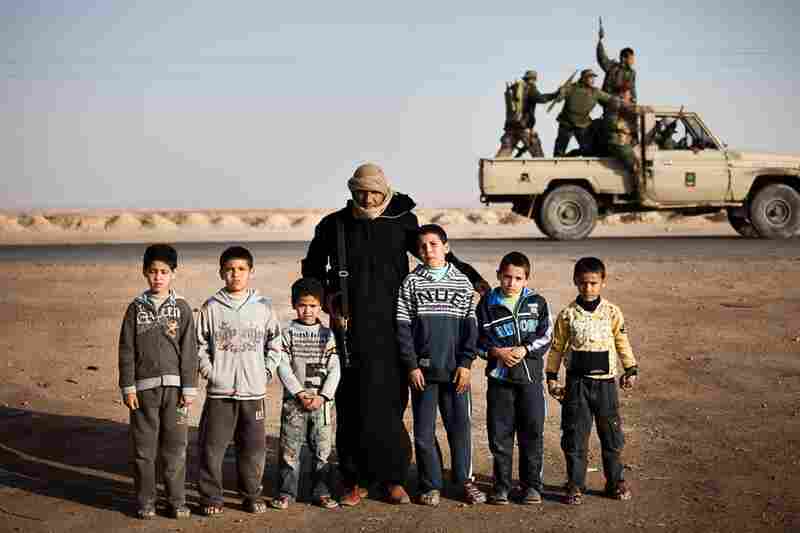 I saw many of those same young men in bloody pieces at the hospitals and morgues, in places like Brega and Ajdabiya. It seems they spoke too soon. 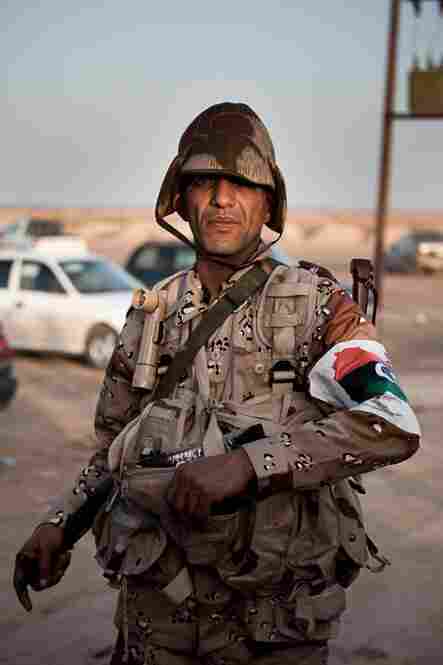 Gadhafi's forces are on the march and are gaining ground every day. In the three weeks I was in Libya, I witnessed the enormous courage of the people there. 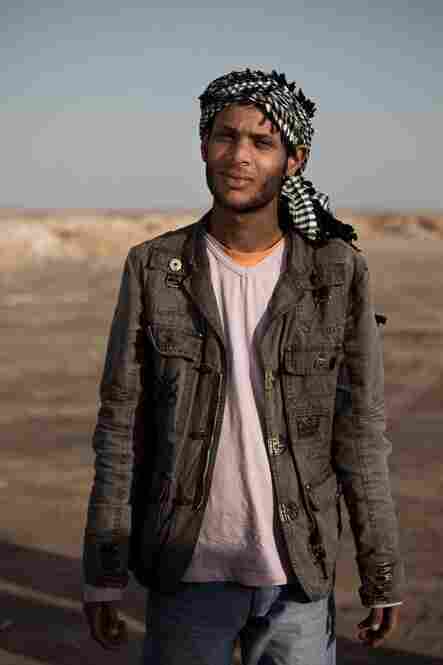 Young men — students, artists, athletes, doctors, lawyers and yes, some Islamists — left their homes to take on Gadhafi's army. Their strength was thought to lie in their diversity, in their willingness to fight and to die for the right to live outside of Gadhafi's brutal autocratic grip. But they had no training, no leadership and no real help. 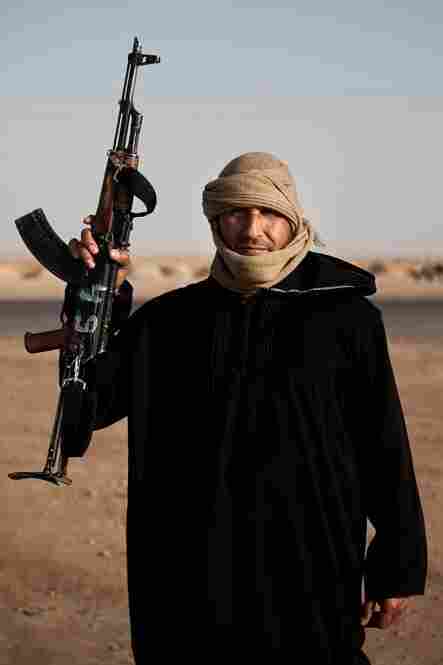 The defected Libyan army troops who initially joined them have largely left them to their own devices. The weapons they've used are no match for what Gadhafi's forces have unleashed. And so the rebel fighters have died. Groups of young men — often friends from a particular neighborhood — would arrive at the front line packed into a minivan or a sedan. I remember one fighter, filled with bravado on that first day, telling me with a grin that facing off against Gadhafi's forces was "cool, man." It's easy, though, in the midst of this continuing battle to forget what it is Libyans in the east are fighting for. Far away from the front line, in a residential neighborhood in Benghazi, I saw evidence of the kind of society some of them wanted to build. Young people worked together to feed and protect their community, to build the civil society that has been denied them for so long. As I left Libya this week and crossed back into Egypt, there were no more triumphant cries. The rebels would stop our car only to ask why we were abandoning them. "Where is the West?" they asked. "Why don't they help us?" The dream that was "Free Libya" is quickly vanishing.